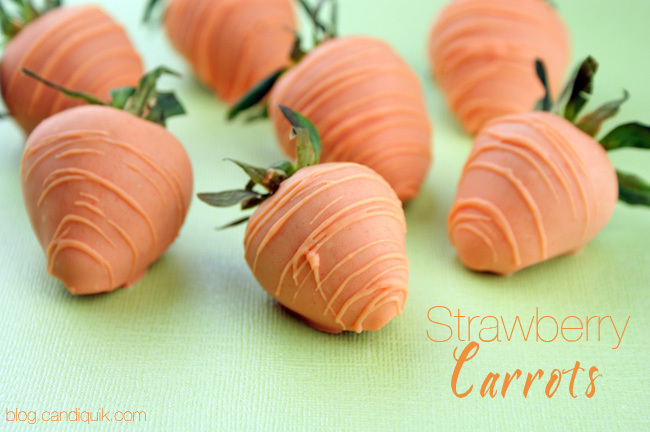 Chocolate dipped strawberries disguising themselves as carrots! A cute edible craft for Easter! 2. Melt CANDIQUIK® Coating in Melt & Make™ Microwaveable Tray™ according to directions on package. Stir in both packets of the orange creme Frosting Creations powder. 3. Holding strawberries by their stem, dip in CANDIQUIK® coating and place on wax paper to dry. 4. Using a spoon (or a piping bag), drizzle strawberries with excess coating to create horizontal lines.